At Family Tree DNA, having Haplogroup Origins and Ancestral Origins indicating Native American ancestry does not necessarily mean you are Native American or have Native American heritage. This is a very pervasive myth that needs to be dispelled – although it’s easy to see how people draw that erroneous conclusion. Let’s look at why – and how to draw a correct conclusion. The good news is that more and more people are DNA testing. The bad news is that errors in the system are tending to become more problematic, or said another way, GIGO – Garbage in, Garbage Out. I want to address this problem in particular having to do with Native American ancestry – or the perception thereof. At Family Tree DNA, everyone who tests their Y DNA or their mitochondrial DNA have both Haplogroup Origins and Ancestral Origins tabs as two of your 7 information tabs detailing your results. The goals of these two pages are to provide the testers with locations around the world where their haplogroup is found, and locations where their matches’ ancestors are found – according to their matches. Did a little neon danger sign start flashing? It should have. Haplogroup Origins provides testers with information about the origins of other individuals who match your haplogroup both exactly and nearly. This data base uses the location information from both the Family Tree DNA participant data base and other academic or private databases. 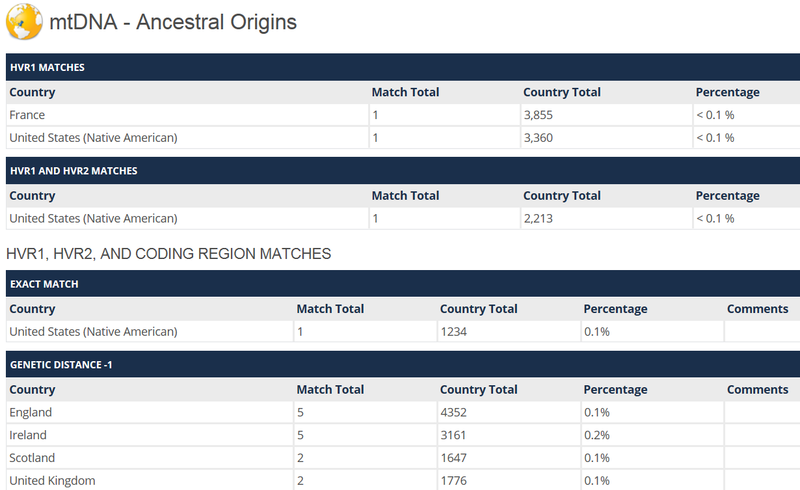 Ancestral Origins is comprised primarily of the results of the “most distant ancestor” country of your matches at Family Tree DNA. This tab is designed to provide you a view into the locations where your closest matches are found at each of the testing levels. After all, that’s where your ancestors are most likely to be from, as well. 1. Participants who are entering the information for their “most distant ancestor” understand that in the case of the Y line DNA – this is the most distant direct MALE ancestor who carries that paternal surname. Not his wife or someone else in that line. Sometimes, people enter the name of the person in that line, in general, who lived to be the oldest – but that’s not what this field is requesting – the most distant – meaning further back in that direct line. For mitochondrial DNA, this is the most distant FEMALE in your mother’s mother’s mother’s mother’s direct line – directly on up that maternal tree until you run out of mothers who have been identified. 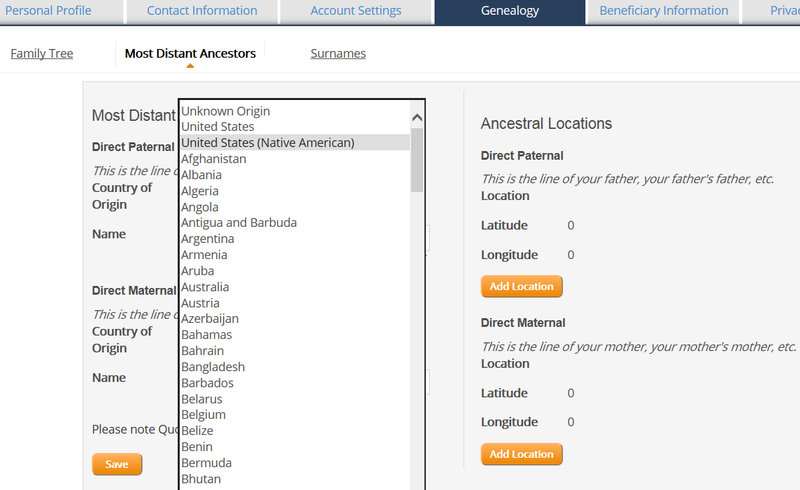 I can’t tell you how many male names I see listed as the “most distant ancestor” when I do DNA reports for people – and I know immediately that information is incorrect – along with their associated geographic locations. In this mitochondrial example, the third match shows a male Indian Chief. The first problem is that this is a mitochondrial DNA test, so the mitochondrial DNA could not have descended from a male. If you don’t understand how Y and mitochondrial DNA descends from ancestors, click here. Secondly, there is no known genealogical descent from this chief – but that really doesn’t matter because the mtDNA cannot descend from a male and the batter is out with the first problem, before you ever get to the second issue. However, if you are someone who is “looking for” Native American ancestry, this information is very welcome and even seems to be confirming – but it isn’t. It’s a red herring. Unfortunately, this may now have perpetuated itself in some fashion, because look at the first and last lines of this next entry – again – another male chief. The second entry with a name is another male too, Domenico. Hmmm….maybe information entered by other participants isn’t always reliable and shouldn’t be taken at face value…. The DNA test comes back and shows heritage other than Native, but that previous information that I entered is never changed in the system. 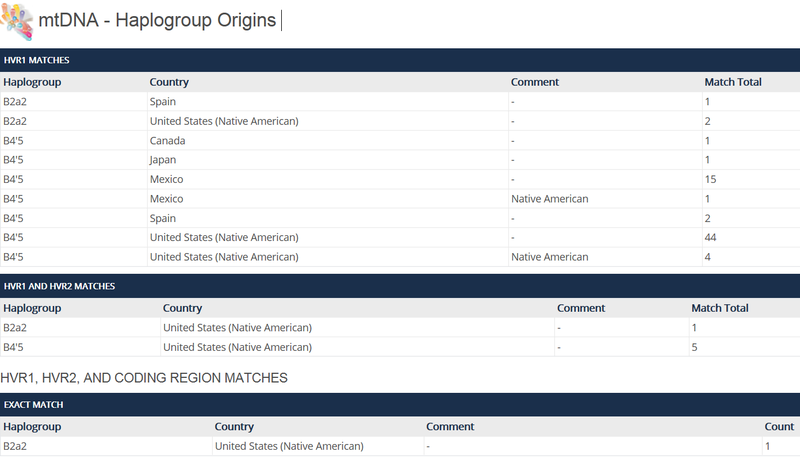 Now, we have a non-Native haplogroup showing as a Native American result. Unfortunately, I see this on an increasingly frequent basis – Native American “location” associated with non-Native haplogroups. This scenario has been occurring for some time now. Family Tree DNA at one point attempted to help this situation by implementing a system in which you can select “United States” meaning you are brick walled here, and “United States Native American” which means your most distant ancestor in that line is Native American. There are a very limited number of major haplogroups that include Native American results. For mitochondrial DNA, they are A, B, C, D, X and possibly M. I maintain a research list of the subgroups which are Native. Each of these base haplogroups also have subgroups which are European and/or Asian. The same holds true for Native American Y haplogroups Q and C.
In the Haplogroup Origins and Ancestral Origins, there are many examples where Non-Native haplogroups are assigned as Native American, such as haplogroup H1a below. Haplogroup H is European..
A big hint as to an incorrect “Native” designation is when most or many of the other exact haplogroups, especially full sequence haplogroups, are not Native. As Bennett Greenspan says, haplogroups and ethnicity are “guilt by genetic association.” You aren’t going to find the same subhaplogroup in Czechoslovakia, Serbia or England and as a Native American too. Haplogroup K is European, and so is U2e1, below. Unfortunately, what is happening is that someone tests and see that out of several matches, one is Native American. People don’t even notice the rest of their matches, they only see the Native match, like the example above. They then decide that they too must be Native, because they have a Native match, so they change their own “most distant ancestor” location to reflect Native heritage. This happens most often when someone is brick walled in the US. Another issue is that people see haplogroup X and realize that haplogroup X is one of the 5 mitochondrial haplogroups, A, B, C, D and X. that define Native American DNA. However, those haplogroups have many subgroups and only a few of those subgroups are Native American. Many are Asian or European. Regardless, participants see the main haplogroup designation of X and assume that means their ancestor was Native. They then enter Native American. In the example above, haplogroup X1c has never been found in a Native American individual or population, although we are still actively looking. Haplogroup X2a is a Native American subgroup. In some cases, we are finding new subgroups of known Native haplogroups that are Native. I recently wrote about this for haplogroup A4 where different subgroups are Asian, Jewish, Native and European. This is, however, within an already known base haplogroup that includes a Native American subgroup – haplogroup A4. When testers see these “Native American” results under Haplogroup and Ancestral Origins, they become very encouraged and excited. Unfortunately, there is no way to verify which of your matches entered “Native American,” nor why, unless you have only a few matches and you can contact all of them. When someone has tested at the full sequence level, remember that their results will show on these pages in the HVR1 section, the HVR2 section and the full sequence section. So while it may look like there are three Native American results, there is only one, listed once in all three locations where it “counts.” In the example below, there are two V3a1 full sequence matches that claim Native American. Those were the chiefs shown above. There are those two, plus one more HVR1+HVR2 individuals who has entered Native American as well. However, if the match total was one for the HVR1, HVR2 and coding regions, that would mean there is one person who tested and matched in all 3 categories, not that 3 people tested. In other words, you don’t add the match totals together. What Does A Native Match Look Like? Of course, not all matches that indicate Native heritage are incorrect. It’s a matter of looking at all of the available evidence and finding that guilt by genetic association. 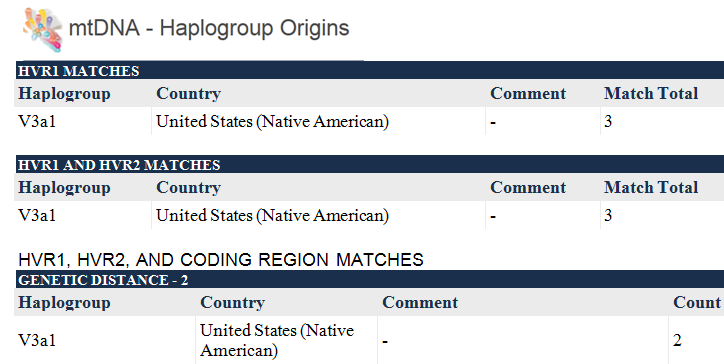 In this first confirmed Native example, we see that the haplogroup is a known Native haplogroup, and all of the matches from outside the US are from areas known to have a preponderance of Native Americans in their population. For example, about 80% of the people from Mexico carry Native American mitochondrial DNA. In this second example, we see Native American indicated, plus Mexico and Canada, which it typical. In addition we see Spain. Just like some people assume Native American, some people from Mexico, Central and South America presume that their ancestors are from Spain, so I always take these with a grain of salt. Japan is a legitimate location for haplogroup B as well, especially given that this result is listed at the HVR1 level. If this individual tested at the HVR2 or full sequence level, they might be assigned to a different subgroup, and therefore would no longer be considered a match. It’s not just what is present that’s important, but what is absent as well. 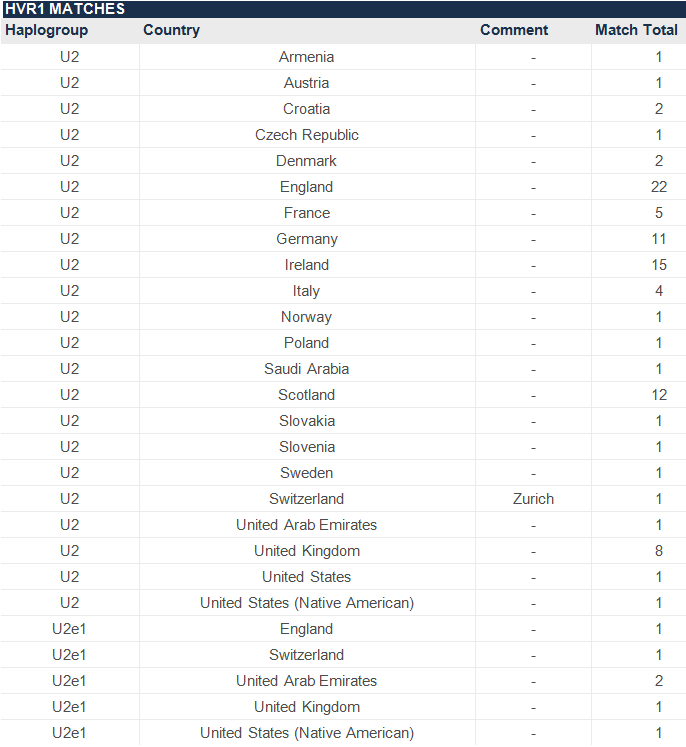 There is no long list of full sequence matches to people whose ancestors come from European countries like the U2 example above. Spain is understandable, given the history of the settlement of the Americas, and that can be overlooked or considered and set aside. Japan makes sense too. But a European haplogroup combined with a long list of primarily European high level matches with only one or two “Native” matches is impossible to justify away. What Does Native American Mean? This discussion begs the question of what Native American means. It’s certainly possible for someone with a European or African haplogroup to descend from someone who was a proven member of the a tribe. How is that possible? Adoption, slavery and kidnapping. All three were very prevalent practices in the Native culture. For example, Mary Jemison is a very well-known frontierswoman adopted by the Seneca with many descendants today. Was she Native? Yes, she was adopted by the tribe. Is her DNA Native? No. Were her ancestors Native? No, they were European. So, are her descendants Native, through her? She married a Native man, so her descendants are clearly Native through him. Whether you consider her descendants Native through her depends on how you define Native. I think the answer would be both yes and no, and both should be a part of the history of Mary Jemison and her descendants. If a European or African women was kidnapped, enslaved or adopted into the tribe, and bore children, her children were full tribal members. Of course, today her descendants might have be unaware of her European or African roots, prior to her tribal membership. Her mtDNA would, of course, come back as European or African, not Native. This is a case where the culture of the tribe involved may overshadow the DNA in terms of definition of “Indian.” However, genetically, that ancestor’s roots are still in either Europe or African, not in the Americas. How Do We Know Which Haplogroups Are Native? One of the problems we have today is that because there are so many people who carry the oral history of grandmother being “Cherokee,” it has become common to “self-assign” oneself as Native. That’s all fine and good, until one begins to “self-assign” those haplogroups as Native as well – by virtue of that “Native” assignment in the Family Tree DNA data base. That’s a horse of a different color. Because having a Native American ancestor has become so popular, there are now entities who collect “self-assigned” Native descendants and ancestors and, if you match one of those “self-assigned” Native descendants and their haplogroups, voila, you too are magically Native. I can tell you, being an administrator for the American Indian, Cherokee, Tuscarora, Lumbee and other Native American DNA projects – that list of “self-assigned” Native haplogroups would include every European and African haplogroup in existence – so we would one and all be Native – using that yardstick for comparison. How about that! Bottom line – no matter how unhappy it makes people – that’s just not true. A great deal of research has been undertaken over the past two decades into Native American genetic heritage – and continues today. The reason I started my Native American Mitochondrial DNA Haplogroup list is because it’s difficult to track and keep track of legitimate developments. Any time someone tells me they have “heard” that haplogroup H, for example, is Native, I ask them for a credible source. I’ve yet to see one. How do we determine whether a haplogroup is Native, or not? The litmus paper test is whether or not the haplogroup has been found in pre-contact burials. If yes, then it can be considered that the ancestor was living on this continent prior to European contact. Native people arrived from Asia, across Beringia into what is now Alaska, and then scattered over thousands of years across all of North and South America. We see subgroups of these same haplogroups across this entire space. The tribes that are less admixed are probably the best barometers of Native heritage today. We are hoping for new discoveries every day, but for today, we must rely on the information we have that is known and proven. Native American haplogroup results today are subsets of Y DNA haplogroups Q and C. If you find a haplogroup O result that might potentially be Native, PLEASE let me know. This is also a possibility, but as yet unproven. Mitochondrial Native American haplogroups include subgroups of A, B, C, D, X and possibly M.
If anyone tells you otherwise, personally or indirectly via Haplogroup or Ancestral Origins – keep in mind that extraordinary claims require extraordinary proof and data is only as good as its source. 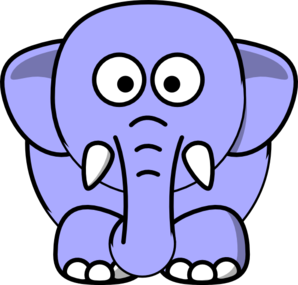 Look at all of the information – what is present, what is absent, the testing level and what kind of documentation your matches have to share. The only things that make you Native American are either a confirmed Native haplogroup subgroup, preferably with proven Native matches, or a confirmed genealogical paper trail. Best of all scenarios is a combination of a Native haplogroup, matches that suggest or confirm your tribe and a proven paper trail. That combination removes all doubt. Of the various kinds of evidence, some can stand alone, and some cannot. DNA Y or mitochondrial Confirmed Native American subgroup – can stand alone sometimes With deep level testing, this can be enough to prove Native ancestry. For Y this generally means advanced SNP testing or matching to other proven Native participants. For mitochondrial DNA, it means full sequence testing. Proven paper trail Proven Native tribal membership, but does not prove ancestral origins Needs DNA evidence to prove whether the tribal member was admixed. Matches to Haplogroup or Ancestral Origins If Native is indicated, need to evaluate the rest of the information. Level of testing, haplogroup, locations of most distant ancestors of other matches need to be evaluated, plus any paper trail evidence. Autosomal DNA matches To people with Native ancestry Unless you can prove a common ancestor through triangulation, those individuals with Native ancestry could be related to you through any ancestor. Matches to several people with Native ancestry does not indicate or suggest that you have Native ancestry. Native DNA ethnicity through autosomal testing Native American results You can generally rely on these results, especially if they are over 5%. Unless you have reason to believe that other regions could be providing some interfering results, this is probably a legitimate indication of Native heritage. Locations that sometimes give Native results are Asia and eastern European countries that absorbed Asian invaders, such as the Slavic countries and Germany. I wrote about this here. If you don’t test, you can’t play. If you think you have Native American ancestry, you can take the Y DNA test (at least to 37 markers) if you are a male, the full sequence test if you are testing mitochondrial DNA, or Family Finder to match family members from all ancestral lines and discover if you show any Native American in your ethnicity estimate provided in myOrigins. Men can take all 3 tests and women can take the mitochondrial DNA and Family Finder tests. Family Tree DNA is the only testing company providing this comprehensive level of testing. Great article. My maternal grandmother said that she was a 1/4 Cherokee. I thought she was probably pulling our leg. I had mom take two autosomal tests through DNATribes.com and Family Tree DNA. On Family Tree DNA Origins, it showed 4% Central/South Asian. On DNATribes, it showed her third hit on the part B results as Miao of Guangxi, China. She got several of these Miao hits. From doing my research, it looks like my mystery great-great grandfather (my grandmother’s maternal grandfather) is the culprit. I have not found any letters or newspaper articles of the scandal. My great-grandmother was conceived in early 1865 when the Civil War was going on. The family lived in western Pennsylvania where Shawnee resided. I have not found any Cherokee in the area at that time. There were not a lot of Cherokee in western PA in 1865 until the Carlisle School in 1879. My mother had a close match on FTDNA with a woman. I contacted her and she was upset about the test. She said that the test said that she was Jewish. She said that she was Cherokee. I told her about Haplogroup X which some Cherokees get. Unfortunately, the woman didn’t seem interested in sharing her line. Sigh. I’m still at a brick wall. There are people out there that are not really interested in their family history and just mention that they did a DNA test at a party. I call these people, “Cocktail Genealogists.” They will not put any information about their line on Family Tree DNA. Frustrating. Family Tree DNA did send out a letter pleading for people to put information about their surnames on the website. Unfortunately, it did not work. I was always told that I was Native American from my father’s side, who I never knew. I was able to trace his family back to a woman living on the Cattaraugus Reservation (Seneca) in the late 1800s which, incidentally, is only about 2 hours from where I live. Anyway, because of her European first and last name, I don’t know if she was an adopted white person or native, married to a white person. I can’t do the y DNA test because I have no surviving male relatives. So, would autosomal testing work for me? It’s confusing. Quite possibly. You’ll never know if you don’t test. Are you saying that it takes 5% NA results to prove you’re of NA ancestry because Family Tree’s testing is that susceptible to errors or because you as a geneticist consider any ancestry further back than that is no longer a person’s ancestry? In the Gedmatch calculator, testing the ‘one to one compare’ autosomal with my raw data, I get a NA segment of 2.5Cm with Clovis Montana (F999919) with minimum threshold SNPs at 500. If my calculations is correct, 5% is nearly 1/16 of an ethnicity. Not much need for DNA testing to see that amount if you know the mixture if you’re familiar with those ethnicities is it? I am A2n. I have my mother’s mothers lines documented back to 1790s Maryland, and her cousin lines documented there prior to that date. I believe my A2n great great great granny was Piscataway. Can you help? So how many pre contact burials make up the database? Thomas Edward Clysdale. My mother spoke some Ojibwa and told me that every summer they traveled from Grand Rapids Minn. north to rejoin the tribe. I have a family record that he was born in 1859. I am looking for his ancestry. Having no luck. I have three sets of baby moccasins that were made for her by her grandmother. Can you help with this?